TwoMaids Blog: Two Maids & A Mop Partners With Pampering For A Purpose in Atlanta!! Two Maids & A Mop Partners With Pampering For A Purpose in Atlanta!! Two Maids & A Mop teamed up with Mary Kay Cosmetics for a great event last night - Pampering for a Purpose. Pampering For A Purpose gives us the opportunity to raise money for Families of Children Under Stress (FOCUS) to support families who have children with neurological disorders, global delays, medically fragile, and those in need of constant care. We had a great time and enjoyed some free makeovers while being able to help our neighbors. 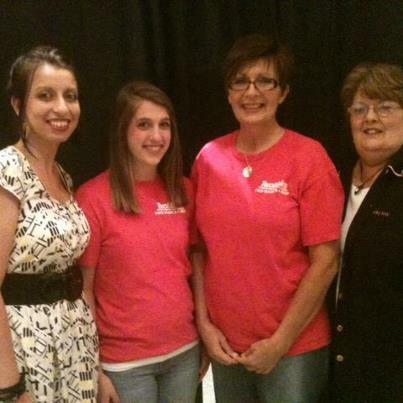 Check out our manager (Liz - left) along with two of our awesome employees posing with a Mary Kay representative!! We were able to promote our Cleaning For A Reason charity last night!! For those of you unaware, we provide FREE housecleaning services to women undergoing cancer treatment. Visit the Cleaning For A Reason website for more details on this free service! !